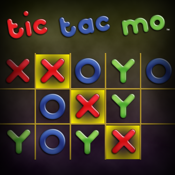 Tic Tac Mo by Ken Mask is a three-person Tic Tac Toe app. If you’ve ever played the classic game of Xs and Os, you’ll be familiar with the familiar game play with nine squares. In this version, you get 15 squares and there are three players: X, Y, and O. As usual, each player takes his or her turn and places the symbol on the grid. The first person to get a row of three wins. You can play against two computer opponents, have two people against the computer, or you can have three people play. The game launches in landscape mode, which means that the grid is three rows high and five columns wide. This makes it more comfortable for you to hold you iPhone or iPad touch to play. The rules are basically the same as in the classic version, except there is an extra player and another column. The game goes by fairly quickly so it would make a good standing-in-line kind of game. If you haven’t played the game before, you can see a description of the instructions on the opening page where you choose how many players you have. Kids ages five and up could play this game. The only con of the app is that there is no option to leave the game once you start, unless you shut down the app by hitting the Home button on your iOS device. You have to play through the game otherwise. This could be irritating if you suddenly wanted to add or subtract a player from the game. Otherwise, it might be a little bothersome to have to pass around your iPhone, iPod touch, or iPad if you have three players, but it’s not impossible. The Tic Tac Mo app is available in 15 languages. It has 11 ratings with an average of five out of five stars. The feedback comments are overwhelmingly positive.